A bid to legalise cannabis in Canberra will be slowed by new parliamentary rules, despite support from Labor and the Greens. The Greens and the Labor executive have already flagged that they will make amendments to the private members bill from Labor backbencher Michael Pettersson when it returns to the ACT Legislative Assembly for debate next week. Althea’s Australian production facility is projected to be operational for 2020 and the company expects that the UK will create a second significant distribution channel for Althea’s Australian grown and manufactured products. Since entering the Australian market in May 2018, 93 registered healthcare professionals are now prescribing Althea cannabis-based products for medicinal use to more than 328 patients across Australia, representing around 20% of the total market. Cannabis retailers across Canada have struggled to supply consumers with product since the country legalized recreational cannabis five months ago, and industry experts say that this trend is likely to last for a few years. Gov. Andrew Cuomo and many state lawmakers have said legalizing marijuana in New York is a priority this year, but questions remain about how adult use will be regulated and taxed. On Saturday, people against a new the sign on Interstate 91 in North Haven advertising a weed dispensary in Massachusetts rallied for it to be taken down immediately. The billboard reads “Weed is legal 60 miles away” and is sponsored by a California-based app called Weedmaps. The app helps its users find pot dispensaries. A strike is keeping many Denver teachers out of the classroom, but one local pot shop still wants to give them a smoke break. In the same spirit as restaurants offering free or discounted meals to furloughed federal workers during the government shutdown, Glendale dispensary Kind Love is selling eighths of its award-winning cannabis for a penny to anyone with a Denver Public Schools badge. The police didn’t want it. Neither did local officials. But the public demanded it. And now, pot companies in California can deliver marijuana directly to your home. In a new survey, United States veterans “consistently and passionately” communicated that they support medical marijuana to treat the common conditions they face after returning from deployment. The Colorado Department of Revenue (DOR) released its monthly reports for marijuana sales and tax data today, which include the final sales and tax data figures for 2018. Numbers from the Oklahoma Tax Commission show medical marijuana sales topped $4.3 million in January, a four-fold increase from the previous month. Legislation to potentially legalize adult-use cannabis in New Mexico has successfully passed the Health and Human Services committee of the New Mexico state legislature. Harvard Business School alum and retired Coca-Cola executive Vicente Fox was not big on weed during his time as president of Mexico – he served between 2000 and 2006. However, in recent years, he’s become a vocal advocate of marijuana legalization as he learned about the plant’s medical potential and realized the economic implications legalization could have. Aurora Cannabis (ACB) announced that it has completed its first commercial export of cannabis oil to the United Kingdom (UK) and the product has been successfully dispensed from a pharmacy. Authorities there recently granted the Company approval for its first shipment of medical cannabis into the UK from Canada under its new legal framework that came into effect on November 1, 2018. Democratic Sen. Ron Wyden of Oregon on Friday introduced S. 420, the Marijuana Revenue and Regulation Act, which seeks to deschedule cannabis by removing it from the Controlled Substances Act, institute a tax on the substance, and set up a system of retail permits for businesses operating within the industry. The tax structure of Proposition 64 proved fatal to some collectives, including the nation’s oldest continuously operating compassionate care collective, the Wo/Men’s Alliance for Medical Marijuana (WAMM) of Santa Cruz. In Jan. 2018, just as adult-use cannabis became legal, WAMM officially closed its doors, in part because of the new tax burden. Medical marijuana cardholders and the caregivers who provide them with pot will get a break on the cost of getting registered under new rules proposed by the Michigan Department of Licensing and Regulatory Affairs. Ex-Speaker of the House John Boehner (R-Ohio) has been named honorary chairman of the National Cannabis Roundtable, an organization to lobby for pro-marijuana policy. Upscale specialty retailer Barneys New York announced plans to sell cannabis products and accessories in a new “luxury” head shop called The High End, the latest mainstream company to capitalize on the marijuana industry. The shop will sell accessories including a sterling silver marijuana grinder that will retail for $1,475. It can be difficult for marijuana businesses to retain their best budtenders, but the payoff for investing in retention is well worth the effort. There is local and state level crackdown presently underway on the popular cannabis extract cannabidiol—commonly known as CBD—because the U.S. Food and Drug Administration (FDA) wants all food products containing this substance to go through the federal approval process before it is sold to the public. Maine, Ohio and New York City have all imposed bans on CBD, citing the FDA’s vague rules. Other states, including North Carolina, have also joined in. It remains uncertain just how far this backlash will go before it is all said and done, and the FDA isn’t helping much to provide clarity. Cannabidiol, or CBD, products are now included in the Prescribers’ Digital Reference — formerly known as the Physicians’ Desk Reference — for the first time ever. Major issues facing the cannabis industry, such as limited access to banking services, have stalled in Congress without even getting a hearing, much less a floor vote. That will change Wednesday, when a subcommittee of the now-Democratic-controlled House Financial Services Committee hears testimony on the difficulty legal cannabis businesses have opening and maintaining bank accounts. Findings in a new study published in Cannabis and Cannabinoid Research suggest that cannabis can be used as an effective alternative to traditional anti-anxiety medications. While Kathryn Frydl admits the challenges in calculating just how pervasive pot smoking became during and immediately after the war, she explains in her book, The Drug Wars in America, 1940-1973, “there can be little doubt that marijuana traffic and consumption surged during the war,” as narcotics agents’ arrests of soldiers would “be futile” since they would only be turned over to military police. In addition, fears about marijuana dissipated as soldiers and officers saw first-hand that cannabis did not create the murderous insanity, or reefer madness, mythologized in the media and in politics during the 1930s and ’40s. 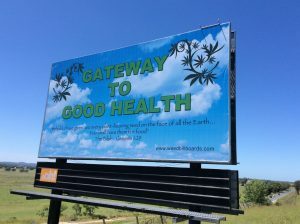 The war on drugs and in particular cannabis is well past its use by date in Australia and in an effort to keep the issue on the agenda we have started a weed billboards campaign. Excited that our first billboard is up just north of Grafton in NSW. It costs $5K for a year, and we’d like to grow weed billboards all around the country. We’d love your help to spread the weed, so there is a gofundme site where you can donate. Please send in billboard suggestions! We’d like this campaign to support messages from various cannabis and drug law reform groups around Australia, so it would be great to pool resources to create more and more new billboards. We are open to all creative ideas, and any size donations. We just want an end to being criminals for using one of nature’s absolute gifts. To mark the anniversary of our special gathering and end the year on a high note, we’ve released five new videos of talks from the Psychedelic Symposium that are now available to watch online and can also be found below in this email.